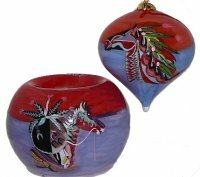 This top shaped ornament and 3" votive holder are hand painted on the inside! They are based on original Amado Pena design each ornament and votive holder takes three days each to complete. Each ornament and each votive holder comes in a silk covered gift box padded to cushion the them inside. The color of the box is coordinated to their design.